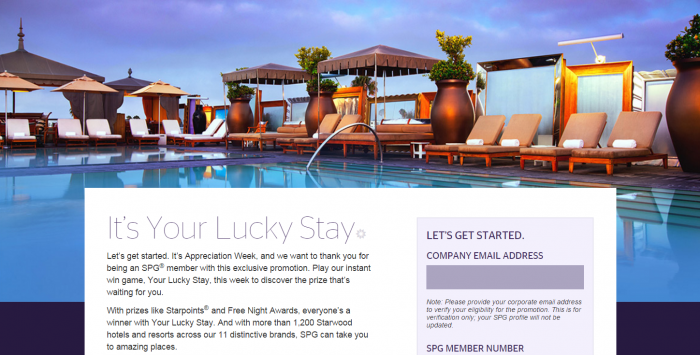 Starwood Preferred Guest (SPG) has launched Your Lucky Stay corporate customer appreciation week promotion for bonus Starpoints and free night certificates. In this Your Lucky Stay game everyone who is eligible to participate is a winner. The participating companies change from week to week. You can try your luck participating to this offer here. I would imagine that most of the corporate travelers from major companies are eligible for this bonus over the next few months. Unfortunately there is no list which companies are eligible and when. Starwood relies on corporate travel managers to inform members when they are eligible (doubt that this would happen in reality). Eligibility: Members must be employed by select companies to be eligible for this promotion. Members must enter their work email address during registration in order to validate place of employment. Registration and instant win prizes only available during select company’s specific Appreciation Week dates (contact your company’s Travel Manager for specific date information). Nonmembers who would like to participate must enroll in the SPG program online at www.spg.com/join and complete the SPG program enrollment form; then visit the registration site to register for the promotion. Registration & Instant Win: SPG® Members must register online at spg.com/yourluckystay by 11:59 p.m. Eastern Time (ET) on the Saturday during Appreciation Week. Registered members are then shown their instant win prize on the landing page which consists of one of the following possible prizes: (1) 250 bonus Starpoints, (2) 500 bonus Starpoints, (3) 1,000 bonus Starpoints, (4) 2,000 bonus Starpoints, and (5) One Free Night Award (Category 1-5). LIMIT: One (1) instant win prize per person, during the Appreciation Week. Fulfillment: Prizes consisting of (1) 250 bonus Starpoints, (2) 500 bonus Starpoints, (3) 1,000 bonus Starpoints, or (4) 2,000 bonus Starpoints will post to member’s accounts within 2-4 weeks. Use and expiration of Starpoints is pursuant to the terms and conditions of the SPG Program. The Free Night Award prize will post to member’s accounts within 1-3 days. Free Night Awards are valid any night of the week and can be redeemed through March 31, 2017 at any Category 1–5 hotel or resort that participates in the SPG® program. To redeem, contact SPG customer service at 1-888-625-4988 in the US, or visit spg.com/contact for other international phone numbers. Mention Award ID A3WFN to the SPG customer service associate. Free Night Awards are nontransferable, may not be given as gifts, and are not redeemable at hotels and resorts that do not have standard rooms. Unused Awards will be forfeited. All promotions are subject to the Starwood Preferred Guest program terms and conditions, which are subject to change without notice and can be found at spg.com. Offer is applicable to individual Members only and not to groups. Not responsible for omissions or typographical errors. Starwood reserves the right to discontinue this offer at any time. To update your communication preferences or learn about our privacy practices, view our Privacy Statement at spg.com/privacy, or access our privacy information line by calling 1-877-782-0071 in the U.S. and Canada or +353-21-4930474 in all other countries. Void where prohibited. Next articleDelta Airlines To Pay 759,000$ Compensation After Baggage Handler Plants Cocaine in Passenger Baggage!